Mr. Omar Khan, director of the International Offices of the Dubai Chamber has met the company commercial officials and he was briefed on the accomplishments and phases of the company’s development. 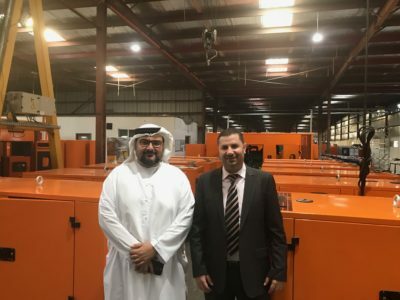 Our Export Sales Manager, Mr. Ahmed Barham, has accompanied Mr. Omar Khan in factory tour and showed him the factory facilities of different equipment, products and industrial lines of state-of-the-art technology, as a one of the UAE’s leading companies in this field. Mr. Omar also praised the advancement and progress that was made in the company, especially in the competition in the global market. Moreover, he stressed that Precision industries should be an example to follow as a one of the most successful Emirate companies in the industrial, commercial and power generators industries’ fields.